With its raking composition and abrupt contrast of black and white, this picture grants us a glimpse backstage at the Paris Opéra without revealing any clear, coherent narrative. The two figures, each apparently absorbed in her own thoughts, may represent a young dancer and her chaperone or, indeed, one dancer dressed for rehearsal and another in street clothes. Only their shared sense of exhaustion and anxiety is clear—suggesting, perhaps, the anticipation or aftermath of an examination. Degas, as no artist before or since, took a keen interest in the physical routine of ballet dancers’ lives, the labor behind their art. At the Opéra, examinations played an important role in this routine, determining dancers’ salaries and professional advancement. Norton Simon Art Foundation, Pasadena, and The J. Paul Getty Museum, Los Angeles (JPG #83.GG.219). Imagine a line running from the lower left corner to the upper right, dividing this pastel into two parts. 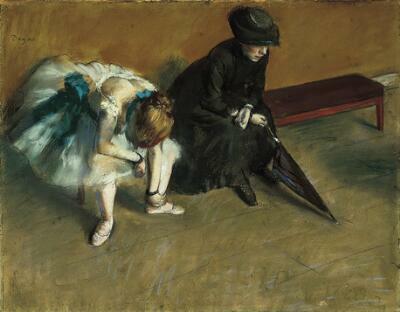 Edgar Degas placed the figures in the upper left half, leaving the lower right part almost empty. Degas often made good use of negative space. Here, it emphasizes the stillness of the scene—and perhaps the boredom felt by the dancer and her chaperone. The vacant space also sets up a number of contrasts that add layers of interest to the composition. The drab, Spartan room is in keeping with the severe black clothing of the figure on the right. But it makes the dancer’s pink tights, satin ribbons and filmy tutu appear even more elegant and ethereal in comparison. Similarly, the softly blended earth tones of the floor boards and wall set off Degas’ vibrant pastel strokes on the luminous figure of the dancer. The figures present intriguing contrasts, too. Though both women lean forward, resting, the chaperone’s back is straight, with her hands properly crossed at the wrist. She passes the time by tracing the seams of the floor boards with the tip of her umbrella. The dancer, however, rounds her back, folding over onto herself. In touch with her own physicality, she massages her left ankle. Degas’ insightful details and careful arrangement of figures and space gives this simple, quiet scene a complexity that rewards extended looking.